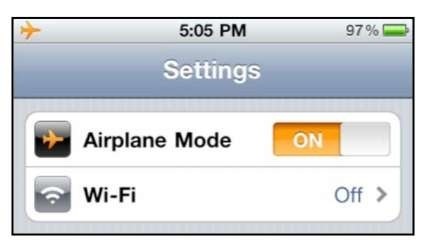 Often when you are flying on an airplane, the flight crew will ask you to turn off all portable electronic devices for takeoff and landing. Then, when you get to altitude, they say "all approved electronic devices" can be turned back on. TIP: Check out the "International Travel" section of topic 5: "Wi-Fi and 3G Connectivity" for many money saving tips you can take advantage when you travel overseas with your iPhone. If you need to turn off your iPhone completely, press and hold the Power button on the top right edge, and then Slide to Power Off your iPhone with your finger. 2. 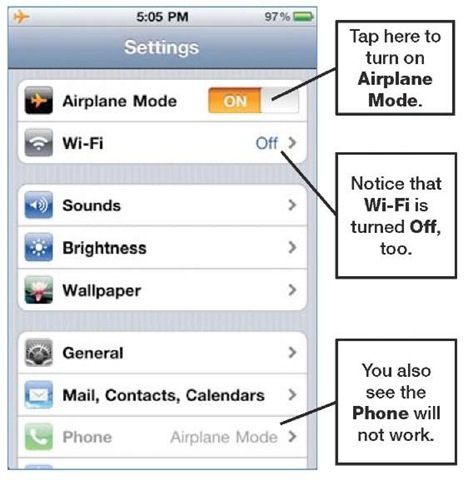 Set the switch next to Airplane Mode in the top of the left column to ON. 3. Notice that the Wi-Fi is automatically turned Off and that the Phone will not work. TIP: Some airlines do have in-flight Wi-Fi networks. On those flights, you may want to turn your Wi-Fi back On at the appropriate time. 2. Tap Wi-Fi near the top of the screen. 3. To enable the Wi-Fi connections, set the switch next to Wi-Fi at the top of the page to ON. 4. To disable the Wi-Fi, set the same switch to OFF. 5. Select the Wi-Fi network and follow the steps the flight attendant provides to connect to in-flight Wi-Fi.